The former Ahavath Sholem Synagogue at 407 Jefferson Avenue (google map) is now threatened with demolition. In December, Housing Court Judge Patrick Carney issued an order to demolish the City's oldest synagogue, one of the last remaining vestiges of Jewish life on the City's East Side. The familiar onion domed landmark on Jefferson Avenue was designed by A. E. Minks and Sons and built in 1903. With the cooperation of Rev. Jerome Ferrell and his congregation, the Greater New Hope Church of God in Christ, this historic structure was designated a local landmark by the City's Preservation Board in 1997. 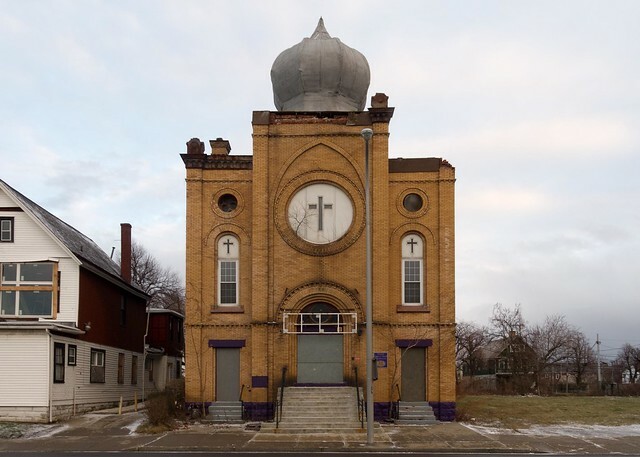 Efforts are now underway to "Save My Shul" and establish a community based preservation campaign to save this historic and threatened East Side landmark. I convened the first meeting at the Jewish Community Center earlier this month and invited ten local preservationists to wrap their minds around what could be done to reverse course and save the synagogue. Thirty people showed up. I asked Jason Wilson from Preservation Studios to present information about the synagogue's possible National Register status. Dennis Maher was invited from the UB School of Architecture and Planning and presented a compelling proposal for the building's reuse. Tim Tielman has agreed to write the synagogue's National Register application as he'd previously compiled the information and wrote the local landmark designation application that was submitted to the City's Preservation Board in 1997. We are currently establishing a series of technical reports - based on architectural and engineering studies - to determine the structure's overall physical condition. Attorney Richard Berger, Campaign for Greater Buffalo attorney and board member, and I asked Judge Carney to amend his "order to vacate" and allow this important preliminary work to go forward. Council Member Darius Pridgen has been very helpful in contacting Rev. Ferrell, the minister of the last congregation to hold services here, for access. To learn more about the City's oldest synagogue please check out a growing set of resources that include this article by Chana Kotzin from the February 10, 2012 issue of the Buffalo Jewish Review. This image archive contains numerous interior and exterior pictures and photographs of the original blueprints submitted to the City in 1903. The synagogue's local landmark designation application from 1997 was made available for wider distribution with Tim Tielman's assistance. Information from the engineering and architectural studies currently underway and potential fund raising plans will be presented at a public meeting tba in mid March. If you know someone who attended the Jefferson Street Schul please send me an email. Thank you. This is fantastic! Thank you for your efforts at building a constituency for this building. Considering all of the newer buildings in this area (townhouses?) and that there is a commercial distract located at the next corner (William & Jefferson) I am surprised that this building has been allowed to fall into such disrepair but again, Buffalo is paradoxical at the best of locations and the east side is always a challenge. The building appears to have retained a great deal of its original stained glass but the west parapet (right) has suffered a great deal of freeze-thaw damage and the stairwell has collapsed from years of moisture cascading from the open roof into the stairwell. It makes me think this area was probably leaking while the building was still occupied considering the extent of the damage as indicated in the photos. 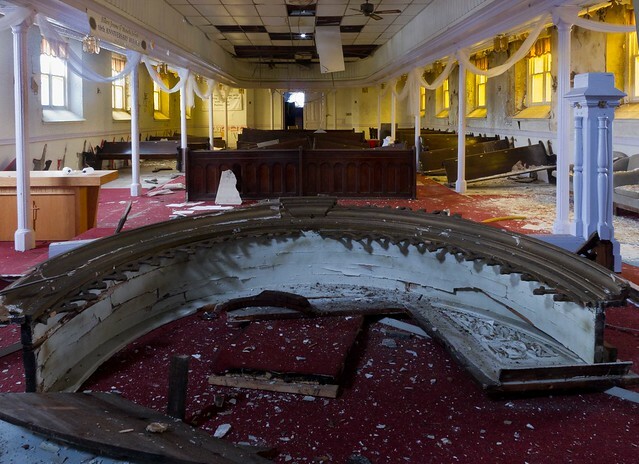 Also, not an overly large building like many of the abandoned catholic churches so the options of renovation may not be too pricey when it becomes time for any agreed upon restoration project. Thank you for posting this. I will cross post on my blog my Jewish monuments blog. Could you give me permisison to use a few of the Flickr photos and then link to the main gallery? This is certainly one of the most important Jewish heritage preservation projects in US. It look like NYC's Eldridge Street did (in terms of decay) back in the 1980s. I'll do what I can to help. I am a new subscriber to this blog. I left Buffalo in 1973 for work in Florida and spent 39 years there until retiring and moving back. I came back because of my sense of community and the preservation of historic landmarks is a community effort. Unfortunately, Buffalo has been in a decline since the '60's and will continue until it reaches it's perverbial 'level'. I learned all about the difficulty faced when attempting to resurrect these landmarks when my father and a select few local Buffalonians battled the Army Corp of Engineers for years to save the lighthouse from demolition and rehabilitation; an incredible structure touted now as the oldest building standing in the city proper. In the Jewish Review article it mentions that $10K was provided for roof repairs. Were those funds spent? Is the plan for the current owner to turn over the property for a dollar to a new entity? Extensive repair was done to the front Taj Mahal type part of the building, this was done about 6 or 7 years ago. Not sure if that was the roof money or not....?? ?